My Arduino Projects: Got My Digispark and Relay Shield!! Got My Digispark and Relay Shield!! 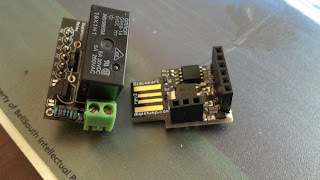 I got my Digisparks (www.digistump.com) and a relay shield yesterday. This little bad boy is tiny and cool because it plugs right into a usb port, no cables or anything! I will be replacing my full sized Arduino UNO and Multi relay shield being used on my coffee maker (Phil-Up) with this bad boy. At first I was going to just pull the old stuff out and rewire this one in. But since it is so small, I think I will now build a small control panel out of a hobby box, put the digispark/relay unit, the button and the light all in one box with a small headphone jack to plug in the moisture sensor and mount the box under the counter (currently I have the light and button mounted in holes drilled in a piece of wood hanging on the front of the counter, the UNO and large relay shield mounted under the counter and wires running everywhere! I got my order several months ago but just now started tinkering with them. I have done a bit with arduinos before. I was thinking that the relay I got was going to be better, I think I was just in a hurry and not paying attention or something. I am looking to make an outlet activated by a passive ir sensor . I got my testing stuff down, with the pir sensor and an rbg shield doing some pwm like an alarm for fun.